A drug and alcohol rehab centre which helps men with addiction is facing closure due to a funding crisis. 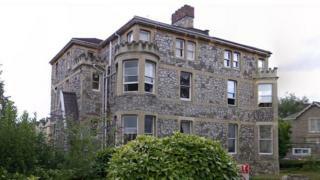 Chandos House in Redland, Bristol, is the city's last residential centre and may close within weeks unless £100,000 is raised, executive director James Dickinson says. Financial cuts from central and local government have seen essential funding and staff halved over the past year. Bristol City Council said funding "goes up and down in line with demand". Mr Dickinson, who helped found the centre 35 years ago, said there had been greater demand on its services than ever before but funding cuts had forced 50% of staff to be laid off. He has launched an urgent fundraising campaign to raise the £100,000 and is running a fundraising day on 7 August which will feature the novelist Will Self as compère. He added: "We need to raise £100,000 in the short term to continue to provide this essential support, while we work towards diversifying our income streams and find new partners, so we may continue for another 35 years." The former bricklayer lost his livelihood when his drinking spiralled out of control and he was run over as he lay unconscious in the road. He suffered horrific head injuries, angina attacks and still struggles with memory loss, but the centre helped him quit drinking. He said: "I come here to cook each week because I want to give something back and I feel grounded here. "It's like a family, we are like brothers. If Chandos closes it will destroy a lot of lives." He now volunteers as a peer mentor and has been clean for 15 months. He is pursuing a career in health and social care. He said: "It was like being reborn. I've been to rehab many, many times, but most places when you're done, they just kick you out. "Here it's like family and you are always welcome back - it's a community. "This is the first place I haven't felt like a scumbag and like I'm worth something. "It would be devastating if it closed- a lot of lives would be lost." Bristol City Council's cabinet member for communities and equalities, Asher Craig, said: "Through our drug and alcohol services we buy placements at different rehab centres for people who need this type of support. "Chandos House is one of our approved providers and funding levels are defined by demand for placements, rather than a fixed amount per year, so funding goes up and down in line with demand. "We know services such as this can support people in their recovery, which is why we recently introduced new recovery clinics promoting residential rehab across different parts of the city, details of which are available on our website."